My baby Aidan is back!! Well, not completely, he still looks spacey sometimes, okay most of the time, but he is doing so well! Today Aidan came completely off his Morphine and Versed. He can get "bumps" of them still, but he usually just gets his Methadone and Ativan doses. Aidan also got extubated today!! He has such a tiny weak little cry right now, it is almost painful to listen to, but that is because he has a major sore throat from the ventilator, so they are giving him some medicine for that. He has been swallowing most of his secretions and only needs suctioning here and there. He has been grunting some since being off the vent. The nurses explained that he does that because its his way of maintaining his "PEEP", which is Positive End-Expiratory Pressure. PEEP keeps the lungs expanded to help get oxygen from the lungs into the bloodstream. 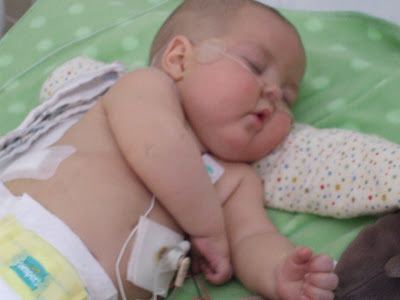 The ventilator used to do this for him, so his body is making it's own adjustments to keep him comfortable. It's so nice to be able to see Aidan's whole face! In a few days he will probably get the nasal cannula out, so we will get his first tube free pictures ever! Michael was unable to hold him today and is still upset that I got to hold him yesterday, so I like to tease him every chance I get about it, LOL. He is looking so good. It so nice to see him with so much less "stuff" around him.